Madison then credits Hamilton for raising up the country from bankruptcy to prosperity, before Eliza puts herself back in the narrative. She sings, “I interview every soldier who fought by your side.” Chernow wrote that in the first decade after Alexander’s death, Eliza “embarked on a single-minded crusade to do justice to her husband’s achievements….She turned to her son, John Church Hamilton, to edit Hamilton’s papers and produce a massive history that would duly glorify the patriarch.” Chernow wrote that Eliza bothered politicians “with detailed questionnaires, soliciting their recollections of her husband.” She even travelled to Mount Vernon to borrow letters that Alexander wrote to Washington. He does not mention, however, Eliza interviewing soldiers specifically. John Church Hamilton’s work was finally published in 1879. Continuing Eliza’s story, she sings, “I raise funds in D.C. for the Washington Monument.” Chernow wrote, “Eliza aided her friend Dolley Madison in raising money to construct the Washington Monument.” Her name, along with Mrs. Madison, Mrs. Adams, and Mrs. Polk were listed as “Lady Patronesses” for a “National Birth-Night Ball,” the proceeds of which were “to be applied to the erecting of the proposed Monument to Washington.” Eliza was also present, “in a conspicuous position” with Dolley Madison, at the ceremonial laying of the cornerstone of the monument on July 4, 1848. The last line of this last song is “Who lives, who dies, who tells your story?” Ron Chernow is a wonderful storyteller, and each biography he has written is well worth reading. I don’t have to speak of Lin-Manuel Miranda’s talents; his musical has given life to historical figures both large and small, and he has told their stories, however briefly or detailed. And I hope that I’ve done a good job presenting some extra facts behind Chernow’s and Miranda’s amazing works. I thank you for taking your time to read this history. 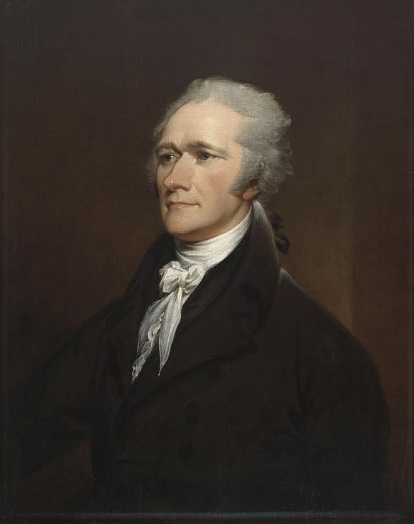 Letters to and from Alexander (as well as other Founders) can be found at the site Founders Online, administered by the U.S. National Archives. Robert Fulton of steamboat fame is also buried in this vault (he married into the Livingston family), although he also has a monument on the opposite side of the church. The aforementioned Albert Gallatin is buried near Angelica. Unsurprisingly, Angelica’s death did not receive the same attention as her sister and brother-in-law. A paper in her hometown, the Albany Register, noted her death: “Died – At New-York, on Sunday evening last, Mrs. Angelica Church, wife of John B. Church, Esq. and daughter of the late Gen. Philip Schuyler, of this city, in the 58th year of her age” (Friday, March 11, 1814, p. 3). This was copied in a number of other papers, including some in New York City. Daily National Intelligencer (Washington, DC), February 21, 1848, p1. Daily National Intelligencer (Washington, DC), July 6, 1848, p. 4. Chernow, 728. He wrote, “She raised money, leased properties, visited almshouses, investigated complaints, and solicited donations of coal, shoes, and Bibles.” The orphanage still operates today under the name Graham Windham. Daily National Intelligencer (Washington, DC), November 11, 1854, p. 3. Next Is This What We Want For Our Future? I binged all 19 parts today. Thank you for the information, it was a very enjoyable read!